When Bart Simpson is starting to become too much of terror at home, the adults decide that maybe it’s time for the little hell raiser to take a little vacation to the other side of the globe. Although he is very excited about the journey, life in Paris, France for Bart Simpson is getting ready to open his eyes to a world that perhaps he never should have experienced. 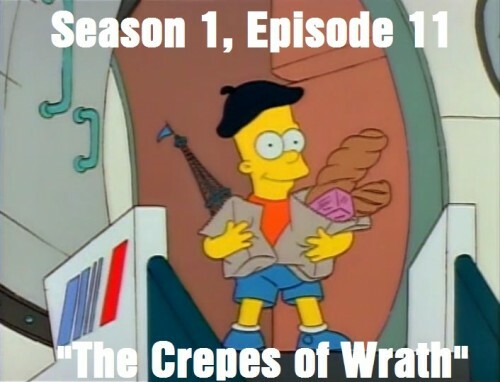 “The Crepes of Wrath” is the eleventh episode of The Simpsons first season. It aired on April 15th, 1990 and even though it wasn’t the last episode of the season, it was the last episode written for Season 1. The chalkboard gag for this episode is “Garlic Gum is Not Funny,” which I agree, garlic is never a good flavor for gum, and the couch gag features the entire family squeezing onto the couch and forcing Homer to get pushed off onto the ground (aka: another repeat). The episode starts at the Simpson house with the immediate revelation that Bart is having a bit of an issue with keeping things tidy. His toys and possessions are strewn all over the house and after Homer trips on Bart’s skateboard, falling down the stairs and hurting his back, Marge punishes Bart by making him clean his room. While cleaning, Bart finds a cherry bomb and decides to use it to play a prank at school. He flushes it down the toilet, causing every toilet in the school to explode, including one that happens to be in use by Principal Skinner’s mother. Principal Skinner takes Bart home and discusses with Marge and Homer a way to punish Bart for his mischievous ways; not by suspension or expulsion, but by deportation. Principal Skinner suggests signing Bart up for the student exchange program, where he would be sent to another part of the world to learn and study in a brand new environment. In exchange, the Simpsons will take in another student from a different country. This way, Bart will have a golden opportunity to see another part of the world, while both Skinner and the Simpsons get a break from Bart’s mischief. Marge and Homer are on board and when Bart hears of the opportunity, he becomes excited as well. Principal Skinner and Homer then celebrate on being rid of the boy’s shenanigans for a few months. Bart is sent to Paris, France to live with two very strict winemakers; Cesar and Ugolin. They live in a worn-down, dilapidated chateau, and they don’t treat Bart as a member of the family, but as a slave to their business. 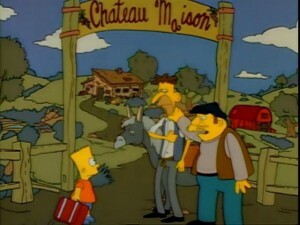 All of Bart’s clothes and possessions are taken by the two French men and some of them are even given to the donkey. Bart very quickly starts to hate his temporary home. Back in America, the Simpsons have opened their home to a little Albanian boy named Adil. Adil is very kind to everyone and is very helpful around the house and Homer takes an immediate shine to him, even to the point of showing more love to him than his own son. During a talk with Marge though, Homer does admit that he does miss and love Bart, he just appreciates the more loving side of Adil. Things start to get a bit suspicious though when Adil starts asking to go with Homer to the nuclear power plant. Homer thinks Adil is just inquisitive about his work and is unaware that Adil is taking pictures to send back to his home country of Albania. It turns out Adil is actually a spy working for the Albanian government and is trying to find out top secret information from American nuclear power plant generators. However, Adil’s signal is traced by the FBI and Homer unintentionally blows Adil’s cover, leading to the prompt arrest of the young boy. Charges are not pressed on Adil as the kid is exchanged for a young American spy who was caught in Albania for a similar act of espionage. Back in France, Bart’s living conditions do not improve and on one rainy day, he catches the winemakers adding antifreeze to their product in order to make a shipment deadline. While being sent on an errand, Bart runs into a French police officer and he tries to tell the man about his predicament, but is unable to relay his information because they don’t speak the same language. Bart starts to feel depressed that he can’t speak French despite living in the country for the past few months, but during his monologue, he realizes that he does know how to speak some French and immediately goes back to the police officer to confess everything. When Bart reveals that Cesar and Ugolin have been putting antifreeze into their wine, the two brewers are arrested and Bart becomes a hero in France. He returns home with gifts and souvenirs for the entire family as the episode comes to a close. As usual, I didn’t get to see this episode until the Season 1 DVD came out, but when I did get around to watching it, my god, I was surprised at how depressing the episode was, at least in terms of Bart’s story. Yeah, Bart can be a bit of a hell-raiser, and sometimes you feel like the bad karma train has to start sometime, but damn, Bart definitely did not deserve what he ended up with. I’ll get more into that later though, when I’m actually reviewing the episode. When examining this episode for favorite moments, there are definitely a few things that really click with me. 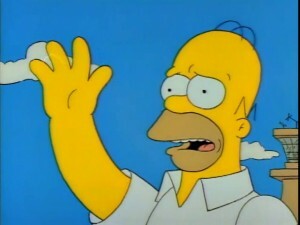 For one, I love how invested Homer gets in Adil being part of the family. I don’t agree with him completely shutting out Bart or making jokes about exchanging Lisa too, but I think you have to realize that when it does come to Bart, he has been testing Homer’s patience for a long while now. Being a trouble maker at home, and having to endure that trauma, even on a physical level (with him falling down the stairs and hurting his back), and then having to hear about his son’s transgressions at school, and from around the neighborhood…honestly, Homer just really wanted a break from that and he got that from Adil, even if Adil’s actions came from a place of dishonesty and deception. Then, when Homer is completely clueless and unaware of what Adil is actually doing, I think it really adds a nice bit of humor to the equation as well. I think one of my favorite lines in the whole episode is near the end when the Simpson family is saying goodbye to Adil and Homer weepingly says, “Good bye Adil, I’ll send you those civil defense plans you wanted!” showing that even after the situation was explained to the family, Homer still didn’t understand that Adil was an Albanian spy committing foreign acts of espionage for his own government. 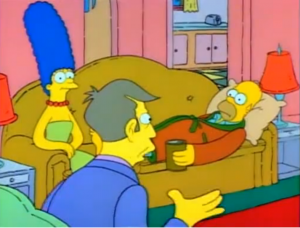 You could say it just makes Homer look like an even bigger idiot, and I would see your logic, but from an entertainment perspective, that was a great line to close that story on. I also think it’s very clever how the writers portrayed International affairs between America and other countries. I feel like this could have been a risky episode to release because some people could watch the episode and think that Albania is trying to spy and steal information from the US and they must be a bad country because of it. However, the last scene of that story shows the FBI informing the Simpson family that Adil is not going to be locked up or imprisoned, but rather sent back to his country at the exchange of an American spy who was pretty much doing the exact thing Adil was doing, giving the message that, “yeah, he was doing something bad, but we are definitely guilty of it too, so we don’t really have room to determine what needs to be done here.” I’m not saying that’s the way all politics work or should work; clearly if nations have to resort to spying, then there is obviously something not right with that relationship and something needs to be worked out, but again, as far as this “television show” is concerned, I think it was a funny route to take. In other words, I think it did a good job of trying to avoid International controversy. I’d say the same goes along with all the France stuff too, although I feel like there was less to worry about there because the evil nature of the two winemakers had nothing to do with them being French, but with them being bad people in general. I also think the conclusion of Bart’s story was well-done as well, albeit a bit predictable and cliche. It’s the classic formula of “living under bad circumstances,” but then coming through or learning something at the end to make it a worthwhile venture. It’s something we’ve seen a lot in television, it’s something we’ll see a lot of in this show; it will just vary in how different the routes are that take that path. I think what makes it good in this path is just the fact that it’s an end to Bart’s suffering and the end of two bad guys who are up to no good. Bart really does go through some terrible experiences, which, despite his behavior at home, is not something he or anyone should ever deserve, no matter the circumstances. I will say though, it will definitely give Bart some things to think about at home. At the very least, I would hope he would try a little harder to keep his room clean, because after three months of sleeping on the floor or in a bale of hay, he’d probably be thankful for just having a bed. I don’t actually have a lot to say about this episode (especially compared to the last episode I looked at). Overall, I don’t think it’s a bad episode, but once again, I wouldn’t say it’s the greatest episode either. It’s got a good story with nice conflict resolution, it has a side-story that’s entertaining to watch, and seeing how this is supposed to be a Bart episode, we get some good moments and some great development with our little yellow-skinned trouble-maker. I think one of the greatest character traits of Bart that gets shown here is that despite Bart’s resume for causing trouble and making mischief, he’s actually got a very strong sense of justice and for the way the law should work. He knows that what his “host parents” are doing is wrong and doesn’t hesitate to go to the police at his first available opportunity. You could say he does it out of convenience, as he is being treated as a slave, but still, we’ll see in future episodes that when it comes to Bart Simpson, he does not let criminals get away with anything. In fact…we may have an episode OR TWO coming up that complements this very well, but of course, I’ll get into that when it’s relevant again. 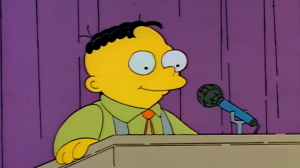 Basically, what I’m trying to say here is that Bart isn’t a bad kid at all. He’s a fun-seeker and a little rebellious at times, but he does know the difference between right and wrong. In fact, I’d almost say the lowest point of this episode is just the act of watching and witnessing Bart go through the trauma of living with his strict host parents. When watching this back, I really felt sorry for Bart and disgusted that he had to live under those conditions. I believe in being punished for something if you do something bad, or that karma is boomerang, but I don’t believe anyone should endure what Bart had to go through, regardless of past acts. It was a little hard to watch honestly, but at least those evil men got what they deserved at the end of the day and it seemed like Bart was handsomely rewarded and given reparations for the few terrible months he had to endure. And hey, Bart learned how to speak French; that’s honestly pretty cool, am I right? So yeah, overall, I’d say it was a good episode and worth a watch, even if the middle of the plot was a bit rough to get through. We only have two more left guys, and coming up, we have a candidate for best episode of the season, and a candidate for worst episode of the season. I’m not going to spoil too much, not to mention it seems like a lot of my opinions have changed or been modified to a rather large extent after doing these rewatches, but at the very least, it’s been a lot of fun doing these retrospectives and I’ve enjoyed it very much. I do apologize for this one going up a bit late, as I meant to post it last week, but I had a lot of work I had to get done which resulted in this getting pushed back a little. And honestly, don’t be surprised if the same happens to the next episode as well, just because I am hitting a very busy point with all of my mediums. I’m still hoping to be done with Season 1 by the end of May, so here’s to hoping that all the cards will fall into place for that to happen!